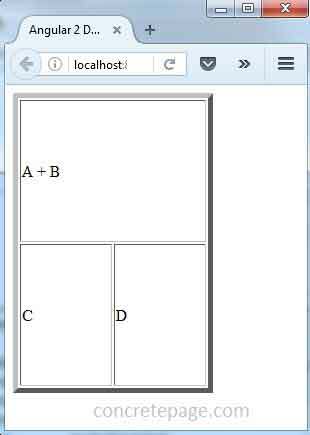 On this page we will provide angular 2 attribute binding example. Attribute binding is to set the value of attribute directly. We must use attribute binding when there is no element property to bind. Attributing binding should be performed with pure attributes such as ARIA, SVG and COLSPAN. Pure attributes are those whose corresponding DOM property is not available. Attribute binding is performed in the same way as property binding with difference that in attribute binding we need to prefix attribute name with attr. keyword. On this page we will discuss the differences between HTML attribute and DOM property. We will also provide complete example of attribute binding step by step using TypeScript. Angular 2 attribute binding is required in those cases when HTML attribute has no corresponding DOM property. Find some differences between HTML attribute and DOM property. Attribute binding is same as property binding with the difference that we need to add attr. as prefix with attribute name. Here we will discuss attribute binding for colspan attribute of <td> element. Suppose we have defined a property clspn with some numeric value in our component. 1. Find the attribute binding using bracket . 2. Attribute binding using bind- keyword. 3. Attribute binding using interpolation. In the above code border and width are using element property binding and height and colspan are using attribute binding.